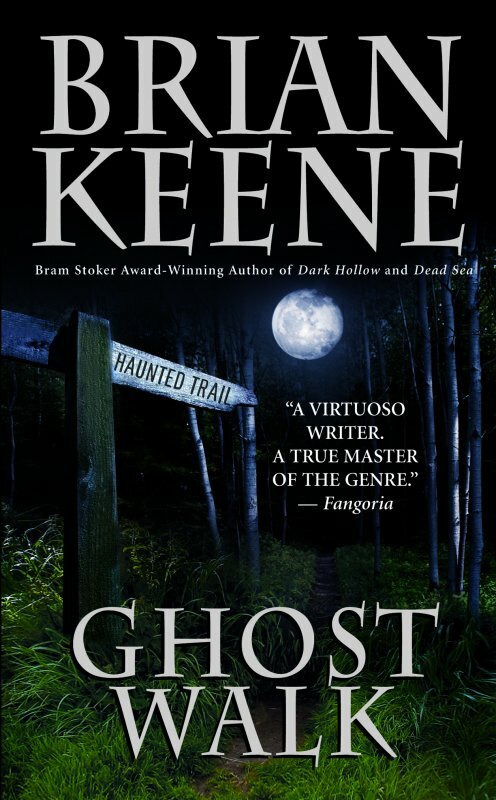 Having heard the name Brian Keene before, as he is quite a prolific horror author, I thought I’d pick up an intriguing-looking book called Ghost Walk from Half Price Books. Since it was only $3.99, I hate to say it wasn’t worth the money, but… it wasn’t really worth it. The premise is intriguing: a burned-out hollow in the woods, which is rife with stories of hauntings, murders, and a goat-man, sits like a shadow in the town of York, Pennsylvania. A man has decided to build a haunted attraction in said woods, a forest walk filled with nightmares. Except an ancient, Lovecraftian evil resides there and has slowly begun slipping through a doorway into this world, infecting those who venture into the hollow by manifesting as their worst fears. Throughout the book, we meet tons of characters that take up 5-10 pages of pure exposition, which is heavy-handed in explaining the “ghosts” of their pasts (since everyone has some sort of tragedy that’s haunting them), and immediately after this the character is effectively killed off by the creature, Nodens. This becomes such a cliché that I actually started skimming these character introductions towards the end of the book because I knew I shouldn’t care about them since they were just going to die in a few minutes. The characters who do stick around are, sadly, two-dimensional. Maria is a journalist who fears her parents’ disapproval. Levi is an annoying ex-Amish man who can do magic and has a rather holier-than-thou attitude. Ken Ripple, the designer of the ghost walk, misses his dead wife. That’s about their only personality traits. The dialogue between these characters was disappointingly juvenile, and I could never quite believe that I was witnessing real people. There wasn’t any mystery, either: you find out early on what the deal is with Nodens, and after that, you know exactly how they plan to defeat the creature. And they do. The ending itself was so abrupt, I wasn’t sure what I was supposed to be left feeling. They defeat the creature in a quick few pages, and then there’s another heavy-handed discussion about what they believe in (there are a lot of unnecessary conversations about God, which are designed to make the characters feel bad if they don’t believe). Then, the book just sort of… ends. I’m surprised that someone as well-known in the horror world would have published such an utterly lackluster paperback, but then again, he has written over 30 books. This feels like one he just churned out for the sake of having another book. The writing itself was bland, lacking in any distinctive style, which leads me to believe he didn’t care too much about the artistic merit of what he was writing. Disappointing from start to finish. I’ll think twice before I pick up another Keene novel.